Timber Tools is your North American representative for Krüsi of Switzerland, serving the USA and Canada. Versatile, Compact, Precise and Reliable. A flyer by a company that supplies drive components for the Krusimatic and is proud to have Krüsi as a customer. An article on the cable carriers used in Krüsi machines in Woodworking International that explains a lot about Krusi's philosophy and values. 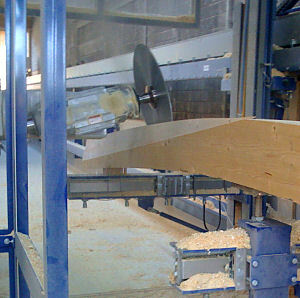 For over 40 years, Krüsi has been a leader in the development and manufacture of CNC timber processing centers, timber frame joinery mills, length-processing machines and log home cutting machines, and most recently, a machine that combines joinery and log milling capabilities.